Bathrooms can serve as a restful sanctuary, but they can quickly turn into a nightmare if you find mildew.Unfortunately, it’s impossible to avoid mildew in your bathroom. But, mildew won’t take over your bathroom as long as you stick to a cleaning schedule. If mildew does form, however, we offer three tips to get it out of your bathroom in this week’s blog. Learn how to tackle your bathroom’s mildew problem! There aren’t too many people who have the time to clean their bathroom each and every day, so that’s way forming small cleaning habits for your bathroom is a great way to fight mold. After every shower, simply wipe down the walls in your shower, and make sure that the floor in your bathroom is dry and there aren’t any small puddles. If a lot of water spilled out of the tub from a bath, make sure to use several towels to properly absorb all of the moisture. One of the reasons mildew forms is because of humid air. 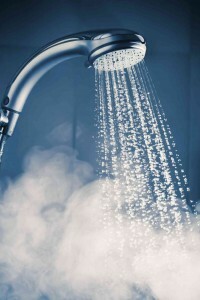 When you take a shower or bath and don’t have a fan on or any way for that moisture to escape, that is one of the catalysts for mildew growth. If your fan isn’t as efficient as it should be, an easy trick to let humid air escape is cracking a window. If you are able to combine that with a fan, you have a great combo for battling mildew formation. No matter what you do, you still might find yourself with mildew stains. The best way to remove tough mildew stains in a bathroom is with bleach, but make sure you don’t use too much bleach. You can remove mildew stains by mixing three parts water to one part bleach, but make sure that you have plenty of ventilation in your bathroom so you don’t get sick or nauseous. Give Master Plumbing & Mechanical a call today at 301-650-9100 and let our experienced plumbers get the job done right. No job is too small and now is the perfect time to take on that plumbing project that you’ve been putting off. This entry was posted on Friday, November 6th, 2015 at 4:47 pm. Both comments and pings are currently closed.